Sapphire is the non-red variety of corundum. The red variety is ruby. Any color of corundum that is not red is called sapphire. If the sapphire is any color other than blue, the word sapphire is preceded by the color designation, for example pink sapphire, green sapphire, or white sapphire. Sapphire can be found in pinks, orange-reds, purples, greens and whites as well as blues. Sapphire is the most precious of blue gemstones and is the birthstone for September. Many people think the darker the stone; the more valuable, but this is not true. The most valuable color is cornflower blue, a rich but very translucent color. Sapphire rings have been popular since the Middle Ages. Clergy often wore blue sapphire rings because the color represented heaven. Others felt sapphire helped ward off evil and sickness, including the plague. Because sapphire blue is a color related to permanence and reliability, women in many countries have selected sapphire for their engagement rings for years. Most sapphires are heated to high temperatures to improve their color and clarity – but the sapphire must have the correct chemistry for heat treatment to work. This type of enhancement is considered common and normal. 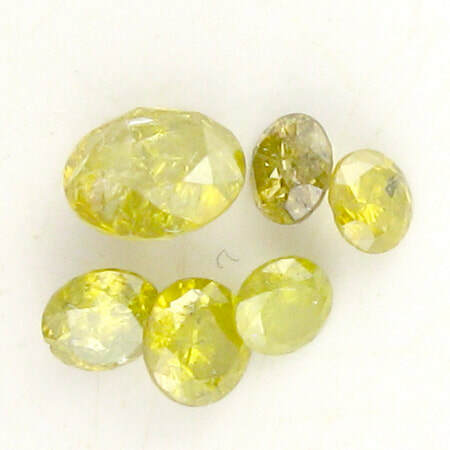 Untreated sapphires are rare and thus expensive. Sapphire was first created synthetically in 1902. Synthetic sapphire has the same chemical, optical and physical qualities as natural sapphire. Synthetic sapphire is often called lab-created sapphire. 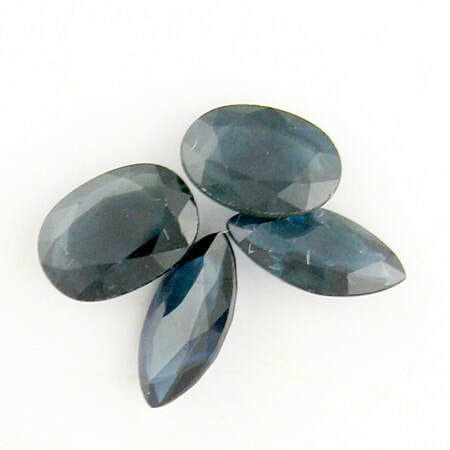 Simulated sapphires are made of materials that mimic natural sapphire’s appearance; for example, glass or crystal. Inclusions of tiny fibers called rutile can create various special effects in cabochon-cut Sapphires (domed stone with no facets). The needle like rutile can appear as a soft sheen referred to as “silk.” If the rutile needles are angled the result is a six-pointed star or “asterism”. If the rutile needles are parallel to each other, they can produce a “cat’s eye” effect known as chatoyancy. Schorl or black tourmaline is the most common color of tourmaline found in nature. It is believed as much as 95% of natural tourmaline is black. It is said that black tourmaline dispels negative energy, bringing good luck to the wearer. If you rub the stone, it will become magnetically charged and this is believed to intensify your good luck. It is also believed to encourage a positive attitude. Schorl is also thought to defend against debilitating disease and strengthen the immune system. Care: Clean only with mild soap; use a soft toothbrush to clean around prongs and behind settings. Serpentine comes from the Latin "serpentinus" meaning "serpent rock" which reflects it olive green color and sometimes scaly appearance. Serpentine also comes in brown, rust, yellow and white and is used extensively in carvings and jewelry. "New jade" and "yellow turquoise" are trade names for green and yellow serpentine. 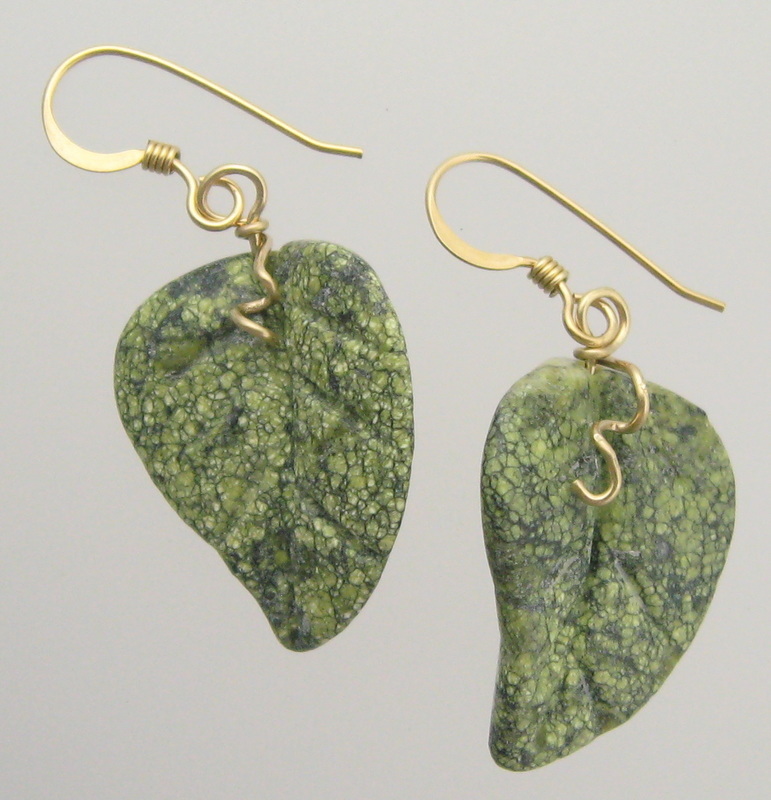 It is said that serpentine protects against poisonous creatures and balances mood swings. Silver is a cool yet lively metal. It is said to attract, enhance and store the energies of gemstones, making it the perfect frame or accent for a wide variety of gems and gemstones. While a lot of silver is used in jewelry manufacturing, almost 60% of all silver production is used by the photographic industry. Silver is the traditional 25th wedding anniversary gift. Early in its history, it was found that liquids stored in silver containers remained fresh and pure longer. In fact Cyrus the Great (king of Persia 550 – 529 BC) had drinking water drawn from a special stream, boiled and then stored in massive silver containers. He also set up a board of health and established a medical dispensary. 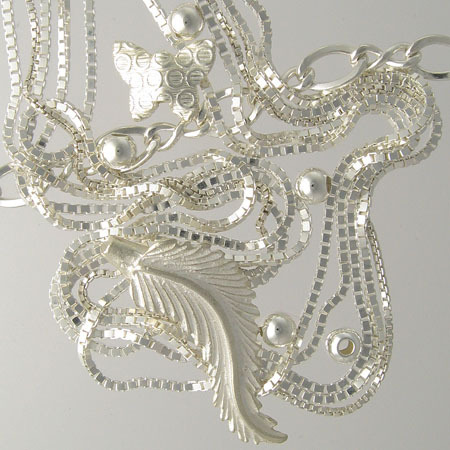 Silver is said to mirror the soul and enhance intuitive and psychic energies. It is the metal of emotions and of loving and healing. 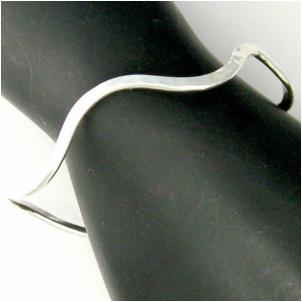 ​Sterling silver is an alloy of 92.5% silver and 7.5% copper. It is often referred to as .925 silver. Sterling silver does oxidize or blacken over time. Use a gentle polish or special polishing cloth to remove the tarnish and restore the shine. Storing your sterling silver pieces in a zip-lock bag will help keep them from tarnishing. Also, the more you wear your sterling silver jewelry the less it tarnishes. I use thin coats of Renaissance Wax on most of my sterling silver jewelry. The wax is transparent, letting the beauty of the silver show, while retarding tarnish. As with all coatings, the wax will wear off after prolonged use. 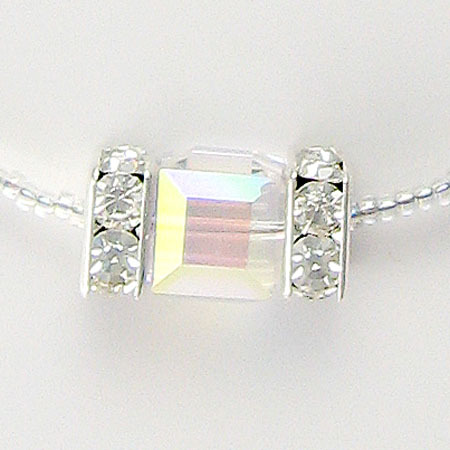 Any tarnish can be removed with a silver polishing cloth or silver cleaner such as Jewel Brite. Don’t be fooled by a name – nickel silver sometimes called German silver doesn’t contain any silver. Sodalite is characterized by its intense blue color. It often has streaks of white calcite. Sodalite’s name probably comes from its sodium content. Although some say it comes from the Latin solidus meaning solid and reflecting its use as a solid in glassmaking. It is often confused with Lapis Lazuli which has a similar chemical make-up and deep blue color. Sodalite has been found in ancient tombs and ruins, often as a replacement for lapis. 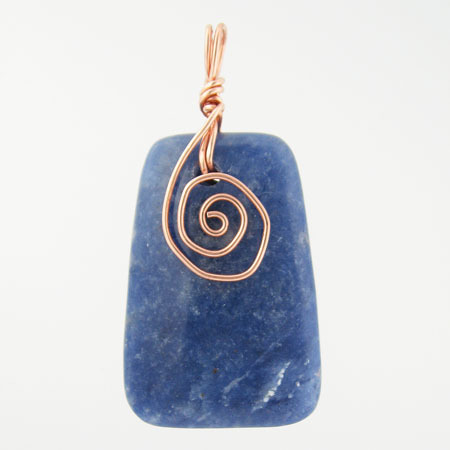 Ancient Egyptian priests used sodalite to dispel fears and promote a clear, insightful mind. Today, it is thought to clear electromagnetic pollution and can be placed on computers to block their emanations or used by people who are sensitive to sick-building syndrome. It is also believed to eliminate mental confusion and encourage rational thought. Care: Clean with mild soapy water. Never use steamers or ultra-sonic cleaners. Pure spinel is white, but impurities give it a wide range of colors including red, blue, pink, orange, purple, and black. The most valuable and popular color is red. Blues are the rarest of spinel colors. Spinels were once confused with ruby and sapphire because of their intense colors and brilliance. Spinel is a durable gemstone perfect for all jewelry. ​Spinel is a birthstone for the month of August. Spinel is connected with energy renewal, encouragement in difficult situations, and rejuvenation. It is said to enhance positive aspects of the personality. 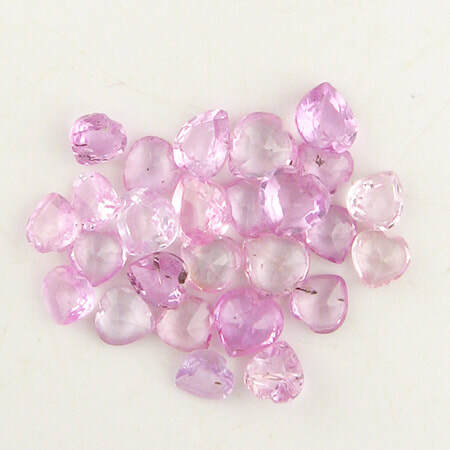 Spinel is also thought to aid in achieving and accepting success with humility. Red spinel is a brilliant intense red. Its color gives it a ruby-like appearance. In fact, throughout history it has often been confused with ruby. The spectacular “rubies” owned by Tamerlane, the Mongol conqueror, Henry VIII of England, and Peter the Great of Russia are all spinels. Red spinels are actually the “rubies” in many of the world’s most famous gem collections, including the Vatican’s and the Crown Jewels of Russia, Iran and England. The Black Prince’s Ruby in the British Imperial State Crown is a magnificent 170-caret red spinel. The Timur Ruby, a 352-caret red spinel, now owned by Queen Elizabeth, has the names of some of the Mogul emperors who previously owned it engraved on its face. It is believed red spinel stimulates physical vitality and strength. Spinel is also thought to encourage great passion and to refill spent energy. It is also believed to aid in relaxation and bring freedom from worry. Sugilite was found in 1944 by Ken-ichi Sugi for whom the stone was named. It ranges in color from pale grayish lavender to deep dark purple. ​Sugilite often contains black matrix or reddish brown or yellow blotches. Stones that are deep purple with no matrix or blotches are the most prized and expensive. ​It is believed to encourage peace of mind and reduce stress. It is thought sugilite protects against and dissipates anger. Sunstone is a member of the Feldspar family. It is a sparkling red-orange stone and gets its name from the way its inclusions sparkle in the sun. Sunstone can have inclusions of hematite, pyrite or copper. Oregon sunstone, a variety of sunstone and the state gemstone, gets its sparkle from copper inclusions. Ancient natives in Oregon used sunstone for barter. Vikings considered sunstone a talisman for navigation and sunstones have been found in Viking burial grounds. Sunstone is believed to bring luck, instill optimism and increase strength and vitality. It is also thought to give you extra energy when you are sick or stressed.